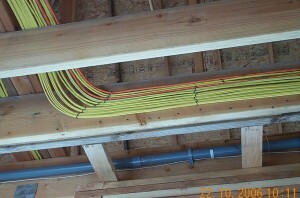 The residential electrical team at Wiring Solutions is capable of impressing even the most discriminatingclientele. Our workmanship and perfection is truly second-to-none in our field. Specializing in new construction, our dedicated team of electricians believe in craftsmanship and care even though their work will go unseen by most. This is on of the many reasons top home builders choose Wiring Solutions as they know their customers see the care put into the work and they appreciate the attention to detail they were not getting with their prior contractors. From time to time electrical work requires service. Our electricians are continually schooled on the latest codes and methods via continuing education courses that go beyond the state mandated levels. Service on our work as well as the work of others is available with the same professionalism you have come to expect from a market leader like Wiring Solutions. If you are building a house individually or are a professional builder, please allow us to bid your project. Residentially and Commercially we have an in-house estimating team and can give you an exact quote on our work. With the electrical system being vastly important in any structure you need to be sure the contractor you choose is both licensed and skilled to do the job right.